Microsoft may be claiming that it’s redoubled its efforts on PC, but it hasn’t had much to show for it yet, Games For Windows Live is dying at an agonizing pace, and now Age of Empires Online is naught but ash and memories. Servers are now offline, never to be seen again. It’s a shame because AOEO had potential despite a litany of flaws, and also look at that acronym. Say it out loud. Ayy-ohhh-eeee-ohhh. Fantastic. Teary eyed goodbye from the game’s last dev team below. This rather unfortunate bomb dropped last week while each member of the RPS team was still out colonizing a different region of space, but I think it certainly bears mentioning. Age of Empires Online, sadly, is history. Or at least, the part where it continues to actively grow and evolve is now another footnote in the series’ lengthy legacy. The free-to-play revamp of the storied RTS series isn’t headed for the more contemplative region of Valhalla just yet, but – from now on – what you see is what you get. No more new content. The Age of Empires Online: Celebration Bundle and the Age of Empires Online: Steam Starter Pack are now available to purchase on Steam, and for a limited time they're available for 50% off! Age of Empires Online is the next chapter in the best-selling Age of Empires PC game franchise features some of the greatest ancient civilizations including the Greeks, Egyptians, Persians, and Celts, with more being introduced all the time! Command the masters of Mesopotamia in this new Pro Civilization. Looking for more quests? The Fertile Crescent Booster offers 30 all-new quests for level 20 cities and beyond. Need more space? Find yourself constantly mailing items to your other civs? This is the feature you need. Release your inner hoarder! Ever made a poor decision that you wish you could reverse, but couldnt? Now you can! For a fee. This update features six powerful new Empire Consumables. Destroy your enemies in style with Palintonons of the Empire, Resources of the Empire, Crocodile Rampage and more. There is now a chance to get two new, hard to find items: the Vanity Ticket and the Golden Ticket. Turn in the Vanity Ticket for a random piece of Vanity Gear in Vanity Island. Or, if youre lucky enough to find a Golden Ticket, you can turn it in to Marcus Pollux for a random assortment of level appropriate gear (up to level 30). This update includes four new sets of Vanity Gear! Outfit your units with the Dragon Slayer, Wizard, Lunch Knight, and Pirate sets! Visit Vanity Island today to purchase your own set. You asked, we answered. 20 new Legendary items are waiting to be discovered, including Belly Bows, Axes, and Scepters. Find them where you find all of your favorite Legendary items! With this new feature, you will now get access to powerful new Milestone techs at levels 5, 10, 20, 30 and 40. Once you pick these Milestones, you can choose one per Civilization to affect your other Civilizations. The more Civilizations you play and level to 40, the more Milestones you'll get. Like to watch? As Spectator, you have your own UI that lets you see what all players are doing, what resources they have, their build queues, how many idle workers they have, and you can switch between perspectives to see intel. All of these panels can be moved anywhere on the screen. Cast away! •	Added support for "Battle Music." •	Variable item effectiveness. Items you craft or find from treasure will now have small differences in their effectiveness. All items found before this patch will remain unchanged. 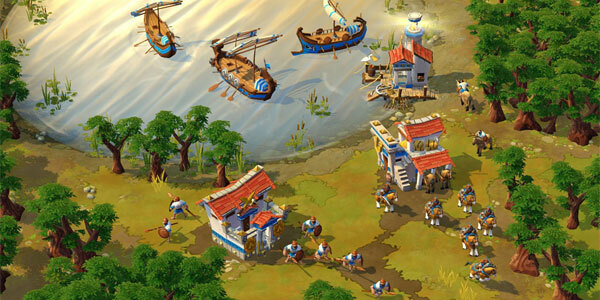 Age of Empires Online is Now Available and Free to Play on Steam. Age of Empires Online is the next chapter in the best-selling Age of Empires PC game franchise.The game features some of the greatest ancient civilizations including the Greeks, Egyptians, Persians, and Celts, with more being introduced all the time, and offers more than hundreds of hours of gameplay for free! Save up to 66% on Civ bundles and Booster Packs. See the store page for more details. Offer ends April 3rd 10AM PST.